Darran Anderson is an Irish writer. He is the author of A Hubristic Flea (3:AM Press), Histoire de Melody Nelson 33 1/3 (Bloomsbury) and Tesla's Ghost (Blackheath Books). He is also the author of the forthcoming Imaginary Cities (Influx Press), Jack Kerouac: Critical Lives (Reaktion Books) and The Ghost Republics. He is the editor of the literary publication The Honest Ulsterman, having previously been a co-editor of 3:AM Magazine and Dogmatika. A Hubristic Flea is a chapbook taken from a journal I kept, having washed up in Cambodia in 2012. It was written as events happened, or shortly afterwards, on a little notepad I kept in my belt. My friend Chris Kelly lives in Phnom Penh and has been making a documentary there on human rights and land-theft, The Cause of Progress, for the past five years. So I followed him around the country for six months, from Ratanakiri in the remote North-East to the Cardamom Mountains in the South-West. At the time, the idea was to record what happened in the “I am a camera” mode of one of my idols Christopher Isherwood. I wanted to stay as dislocated as possible. A writing version of Vertov’s kino-eye, as absurd as that sounds. On the surface, this was to try to avoid falling into some typical occidental gaze but looking back, I think it was really because I wanted to lose, and possibly destroy, myself as much as humanely possible. Either way, it was impossible. The self seeps in, whether you want it to or not. I’ve put the final book (working title The Torrid Zone) into a time capsule for the foreseeable future, given it deals with real people and real events, life-changing in some cases and perhaps too close to the bone for the time being. The last time I read it, loathe as I am to have a point to the thing, it seems unintentionally to be about how friendship can pull you back from the abyss. A Hubristic Flea is a glimpse of that. More importantly, it’s about Cambodia and the people there and what happens when you let the tape roll and try to commit everything to memory. At first, I had all these ridiculous psychogeography techniques in mind such as walking across Phnom Penh at night the way Dickens did in Sketches by ‘Boz’ to investigate the place. And it soon became clear I’d be killed doing such a thing. So instead I hung around, drifted, kept my eyes and ears open, tried to let the city dictate what it wanted to. And the stories come to you, in a thousand different ways and directions. Sometimes it’s a case of being careful what you wish for. A city like that has ghosts, living ones and dead ones and it’s hard telling who is who after a while, including yourself. One interesting aspect from A Hubristic Flea is realising how subjective perception is and how memory is partially fictional. I can talk to people who were there at that time – at crime-scenes and ruins in the rain-forest, in the Sodom and Gomorrah side of the capital, on deserted islands in the gulf – and their recollections are completely different from mine, and both are completely different again to the notes I kept as it unfolded. The past, because it’s located in the mind, seems inherently deceptive. Every account is different, yet no one is lying. That’s a paradox we’ve yet to fully grasp but there’s a world to explore in it. Thinking back now, even though it was only a couple of years, is like thinking back to a past life and at the same time it exists as an incredibly vivid and tangible film in my head. At the moment, I’m writing a book, inspired by Calvino and Borges, on imaginary cities for publication with Influx Press next year. 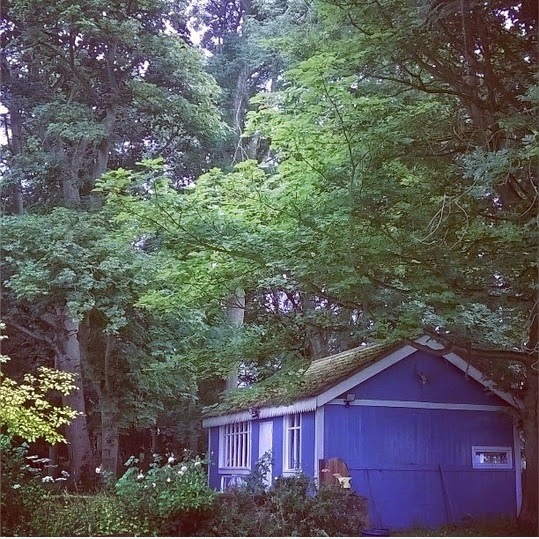 I’m staying in the woods in Fife, Scotland, where my fiancée grew up and where her family have lived since before the time of Mary Queen of Scots. The whole area is witch country and it still feels that way. There’s a dark magic to it for even a cynic like myself. During the day, you hear the crows conspiring in the canopy, punctuated every now and then by the thud of a shotgun in the distance, a jet fighter overhead or the old terrifying air raid sirens from the airforce base not far along the coast. Some days you watch the fog roll in from the sea across the fields. Other days, like today, there’s complete silence except for the rain and an ocean of trees rustling in the wind. It’s a long way from the tropics but it’s nothing really in the grand scheme of things and, as with the other cities in the book, it’s just a question of closing your eyes and floating away.